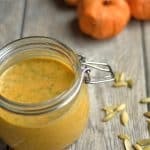 Smoked Pumpkin Vinaigrette combines pumpkin with ginger, plenty of spices, smoky taste, pumpkin seeds, and a hint of sweetness. 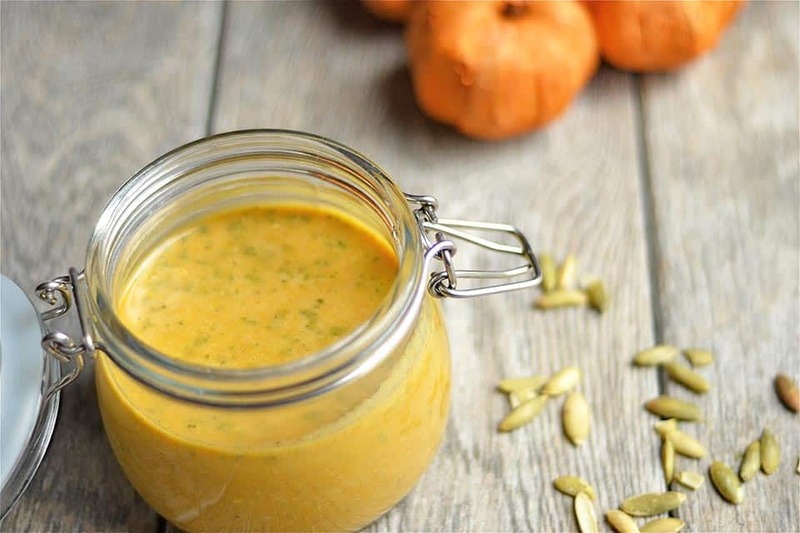 Dress up your autumn salad or Thanksgiving dinner with this delicious hearty dressing! I am always on the lookout for my new favorite dressing. Salad is my lunch and dinner staple, and I love to stock my fridge with tasty and creative ways to enjoy my salads! 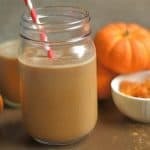 I have yet to try one with pumpkin, and set out this afternoon to use up some extra canned pumpkin in my fridge. So with a bed of quinoa, spinach, dried cranberries, pumpkin seeds, and fresh cilantro, I came up with this. 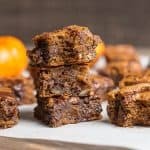 I had to keep adding various ingredients to get it just right, but I am sure it is one that you will love too! 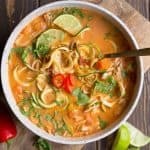 The liquid smoke adds just the right amount of smoky-ness, and the added fresh ginger kicks it up to a slightly spicy notch. 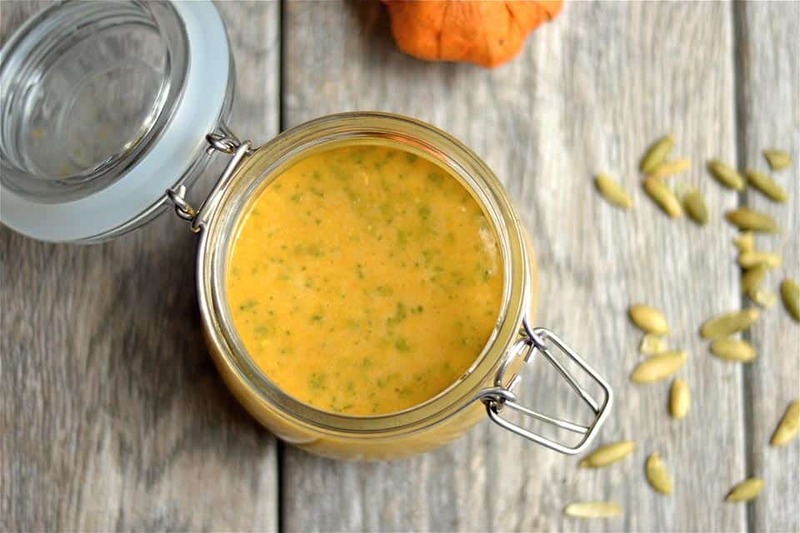 I love the addition of the pumpkin seeds to give the dressing a perfect crunchy and thicker texture. 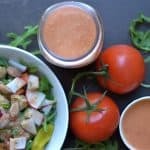 This homemade dressing is also packed with nutrition! 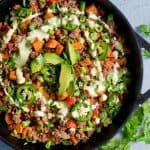 A much better alternative to the high sodium and high sugar options that you find in traditional bottled dressings, and tastes so much better! So what type of salad should go with this dressing? 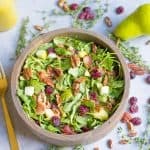 I have a few ideas, but I love a traditional fall spinach salad with dried cranberries, maybe some pears, pumpkin seeds or pecans, and an optional addition of bacon or feta cheese. Throw on some grilled chicken and you also have a perfect easy weeknight dinner! 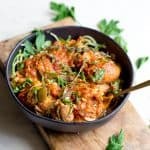 Place all ingredients into a food processor or blender. Pulse until smooth, add more salt to taste if needed. *If you prefer a more tangy dressing (I do), use 1/2 cup vinegar to 1/2 cup oil.